We wrapped up our week yesterday by attending a reception/celebration of the marriage of my little brother and his wife. 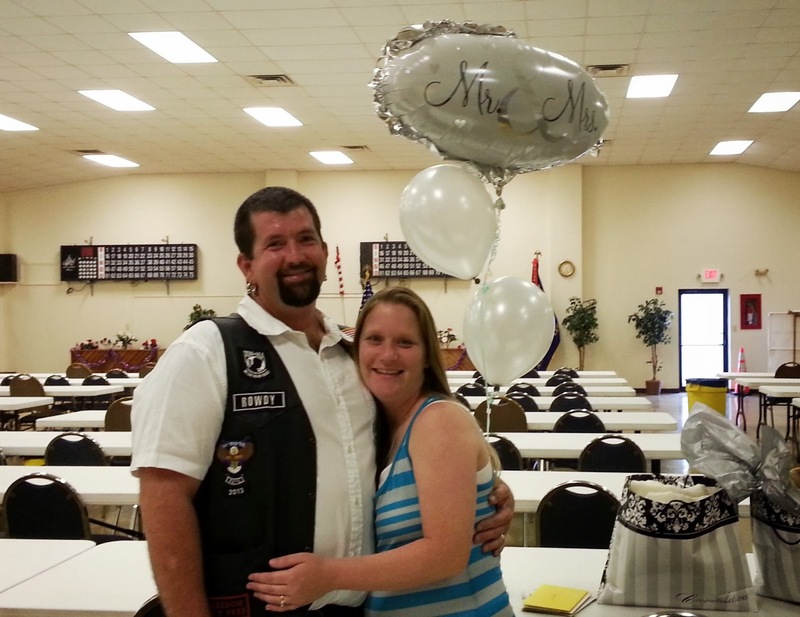 They had a private wedding a few weeks ago, but wanted a chance to celebrate with their loved ones. It was a lot of fun! They had a beautiful cake, got some gifts and enjoyed the time with everyone. This week we hope to enjoy some quality down time together. I am trying to mentally prep myself for my kids' vacation with my parents the week after next. I know they will have fun, but they are going to be about 10 hours away from me for a few days. That's hard for this helicopter mama, lol. At the end of the week, the hubs and I will be joining them. It'll be a nice weekend at the beach. Enjoy the start of your July and have a happy 4th! We've got some great plans for the kids...lots of nature activities, craft projects, experiments (this is where all of that homeschool science stuff comes in handy, lol) and sports to play. It usually runs smoothly, and I expect no difference this year. I'm still working with the insurance company on getting the claim from the accident settled, so that might interrupt my week here and there, but it shouldn't be too bad. Needless to say, the day camp will pretty much count as our school this week. Since Braeden will be doing all of the things we have planned, he's covered for the week. Bailey will be a helper, and even if he's not actually participating in certain activities, I'm going to have him document/journal the week. Yep, I'm totally counting that journaling as teaching writing. Heh. Short post, I know. But I'm off for now. We are taking my grandmother out to lunch for her birthday, then I need to come back and get everything ready. I'm a procrastinator (I'm sure that doesn't surprise anyone), and of course I don't have a thing ready to go for tomorrow, lol. Remember in my last post, where I said goodbye to my mini van? Well we replaced it! Not with another mini van because honestly, we didn't really find any in the price range we were looking for. We are not the most financially responsible people, lol, so we are very proud of ourselves for determining what we could afford each month (we haven't a car payment since 2010, so this was a killer to figure out! ), and sticking to that. 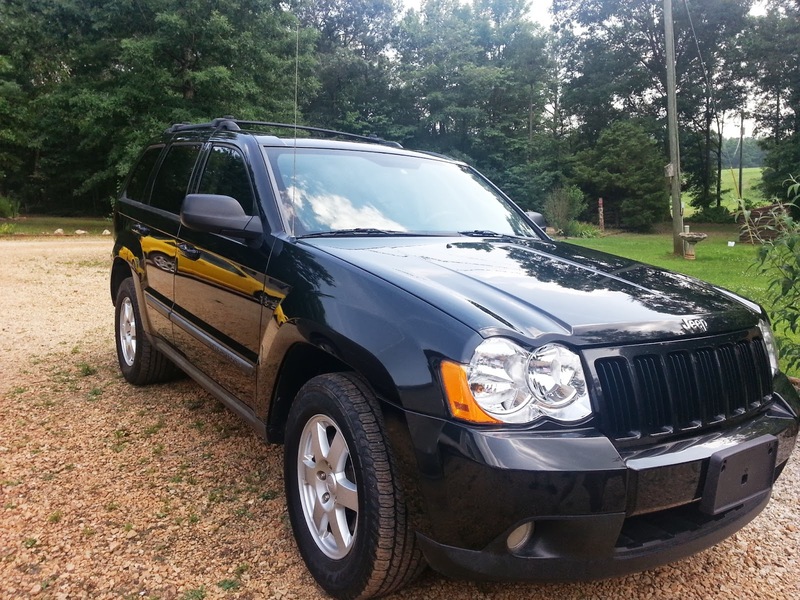 It's a 2009 Jeep Grand Cherokee. 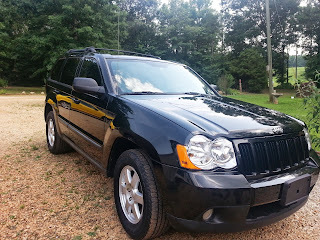 Veeeery different than a mini van, lol. We've never owned an SUV before, but we are really enjoying this one so far. We knew we couldn't get a sedan or anything because it would be too small. We looked at a Dodge Journey, which is like a crossover (between SUV and van), but we couldn't get the payments for that in our price range. As it turns out, that was a good thing. The boys love this, and so do the hubs and I. Last week went well. My mom came up for the week, so we enjoyed the visiting with her. This week the boys will plug away at some of their summer stuff they are working on. 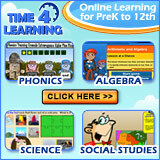 Bailey is working on online algebra (getting ready for high school math...gulp!) and Braeden is working on handwriting. Again, lol. I swear...that child hates holding a pen/pencil! Signing off to spend this beautiful Sunday with my family now...wishing a Happy Father's Day to all the dads out there, with a special wish for my own dad, and the hubs! A word of warning: this is going to be kinda whiny, lol. Last week started off great. Monday we went to Six Flags, and had a blast! Tuesday, we went to see Harry Potter and the Sorcerer's Stone at a local theater. That was fun...I hadn't seen that movie in the theater since it's opening weekend in 2001 and the boys, obviously, have never seen it in theaters. After the movie we enjoyed lunch with some great new friends, and hung out at said new friends' place and played, swam and really had a great time. 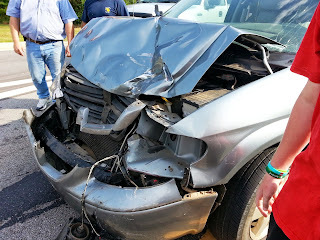 On the way home Tuesday afternoon, I was involved in my first major (major to me) car accident. Someone was in an awfully big hurry to turn into the Dollar General, and tried to turn left in front of me. I guess a more accurate description would have been to say "tried to turn left ON me." Yup. That's what left of my van. My PAID OFF van. :( I'm still waiting on the insurance adjuster, so I don't know that it's actually totaled. But the auto repair guy that came and towed it said it was totaled, as did the officer on the scene. As sad as that makes me, I am beyond grateful that my boys suffered no injuries at all. A little soreness where their seat belts were, but even that was very minor and really only bothered them Wednesday morning (the day after). I have bruising and soreness/stiffness where my seat belt hit and some injuries to my legs, but they were very minor compared to what could have been. Something (I honestly have no idea what really) came through under the steering column and hit my legs. Abrasions, some 1st degree burns and some pretty nasty blood pooling/bruising. 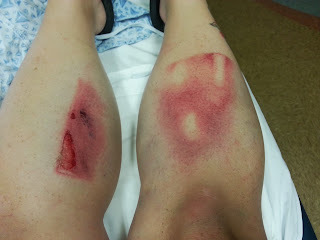 This is right after the accident, at the hospital. Believe it or not, the burns and abrasions are healing really well. My legs are still super swollen, and more shades of red/blue/purple/black/yellow than I have ever seen, lol, but all in all, I got away lucky. Yep. Very grateful and blessed. Needless to say, the remainder of the week didn't go as planned. We actually got nothing accomplished. Nothing around the house. No school (other than some lessons on force and motion, a la "this is what happens when your car is in motion and going this fast and hits something wth this force," which the hubs thought was a funny joke, lol). No grocery shopping. Nuttin. We will try again this week. I will be dealing with accident reports, insurance claims and adjusters, but between that, we should have some good time at home. Fingers crossed. 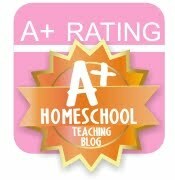 If you're perusing the blogosphere, and you're looking for less whiny and more schooly, you should should head over to this blog I follow, about military homeschoolers. No, we aren't military, but she is homeschooling 3 boys and really seems to manage her time well. I enjoy taking a peek at her life, and I'm sure any of you would as well. It's called Homeschooling My Three Sons. When did June get here? Last week went just as I hoped it would. Very low key. Yay! We hung out at the house, spent time with new friends at the park, and just enjoyed not having a lot to do. School went well for the boys, and we are looking forward to summer fun stuffs coming up! Tomorrow we are going to Six Flags for the first time this season, and that should be fun. I'd rather go to White Water, lol, but we are saving that for when the hubs can join us. He could care less about Six Flags, so the boys and I are going to go with Tracy and her boys. We are also hoping to hang with friends throughout the week, so traditional school-ey things will probably be less. They are also going to work on making their own little grill. This will be loads of fun, but it will also be incredibly useful. I follow a Roadschooling page on Facebook (seriously...one day we WILL become roadschoolers. I just know it. 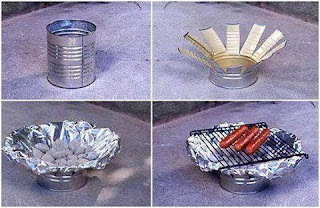 ), and they had a little DIY grill activity.